The Beschefer property is located in Bapst and Beschefer townships in northwestern Quebec, approximately 140 kilometres northwest of LaSarre and 190 kilometres west of Matagami. The Selbaie Mine is approximately 10 kilometres to the northwest. The property is in a region of large swamps, where access is difficult except in the winter. However, the property is criss-crossed by a network of heavy-equipment roads built for reverse-circulation and diamond drilling programs. These roads provide access to the entire property. The Beschefer property covers an area of approximately 4,075 hectares and is composed of 257 claims. Yorbeau owns a 100% interest in all of these claims, except for the 137 claims that were acquired from Explorers Alliance Corporation, in which Yorbeau owns an 80% undivided interest and which are subject to a 1% net smelter return royalty. The property is underlain by basaltic-to-rhyolitic rocks of the Matagami-Brouillan domain in the north and by Enjalran basaltic rocks in the south. Ore deposits in the region are of two types: 1) polymetallic, including Matagami-type copper-zinc deposits with silver and Selbaie-type copper-gold-zinc deposits; and 2) gold. The Beschefer property has potential for both types of deposits. 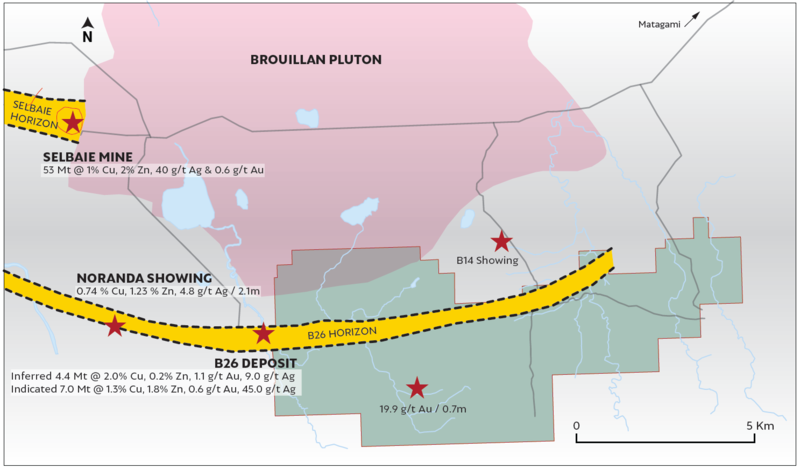 Significantly, the property is located immediately to the east of the B-26 deposit on which SOQUEM recently completed a major definition drilling program. From 2014 to 2017 SOQUEM did considerable drilling in order to confirm Billiton’s estimates and recently published indicated mineral resources of 7.0 Mt grading 1.3% copper, 1.8% zinc and 0.6 g/t gold. In addition, inferred resources of 4.4 Mt grading 2.0% copper, 0.2% zinc and 1.1 g/t gold were estimated. On Yorbeau’s Beschefer property itself, previous drilling has confirmed the presence of the same rock types as in the B-26 deposit. However, no significant results have yet been obtained in the portion drilled so far. The exception to this is a narrow high grade gold intercept in the south part of the property which yielded 19.9 g/t gold over 0.7 metres. Following detailed compilation work by Yorbeau, a deep-penetrating electromagnetic survey was completed in the winter 2016 along the regional B-26 horizon which crosses the whole property. Several conductors were identified by the survey and some of them were drill tested in 2017. The drilling program did not return significant mineralization but confirmed the presence at Beschefer of the same felsic horizon that host the B-26 mineralization. A few conductors remain to be tested in the west part of the property, i.e closer to the B-26 prospect. The whole area around Beschefer (often referred to as the “Detour Trend”) is presently one of the most active exploration areas in Quebec, and Yorbeau’s property is rapidly gaining strong interest from other mining companies working in the area. To view some samples of the various rock types encountered in the Beschefer property volcanic sequence, please consult the PDF document.